From January through December, let's take a look at what New England has to offer this year. Every New Englander who owns a fishing rod has their favorite hotspot and species, with options running the gamut from smelts in coastal Maine to Long Island Sound stripers. With all this diversity, the following is a sampling of “fisherman’s dream” trips for every month in 2019. Let’s go fishing. By now Maine’s largest freshwater lake is locked in tight with enough safe ice to accommodate anglers from Greenville to Seboomook. The most popular January species is the landlocked salmon, which grow to 10 pounds and are common throughout the lake. Moosehead salmon fishing is so popular because these fish are relatively easy to catch. 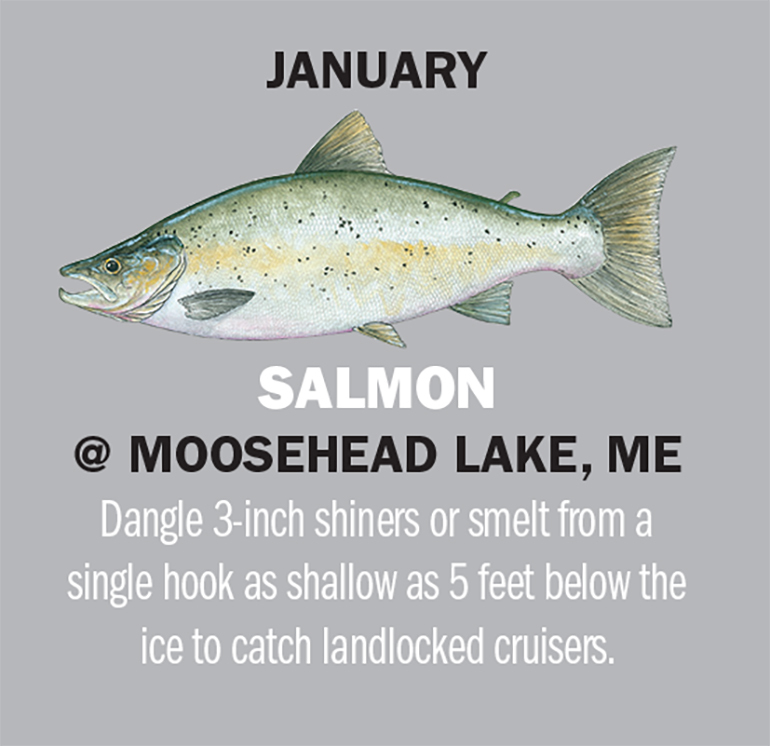 Known to cruise just under the ice at depths as shallow as 5 feet, landlocks are fond of lively, 3-inch shiners or smelts dangled from a single hook. Start cutting holes before sunrise to catch the first bite and check baits frequently because salmon rarely show interest in a dead or listless shiner. Plan to fish all day because salmon are active from sunrise to sunset and may start a feeding frenzy at 11 a.m. or 2 p.m. When the blitz begins flags will be flying during that short but exciting period. OTHER OPTIONS: Rhode Island’s coastal tautog (aka blackfish) provide exciting action for intrepid anglers who can drop a clam or cut bait into the rock depths near shore. 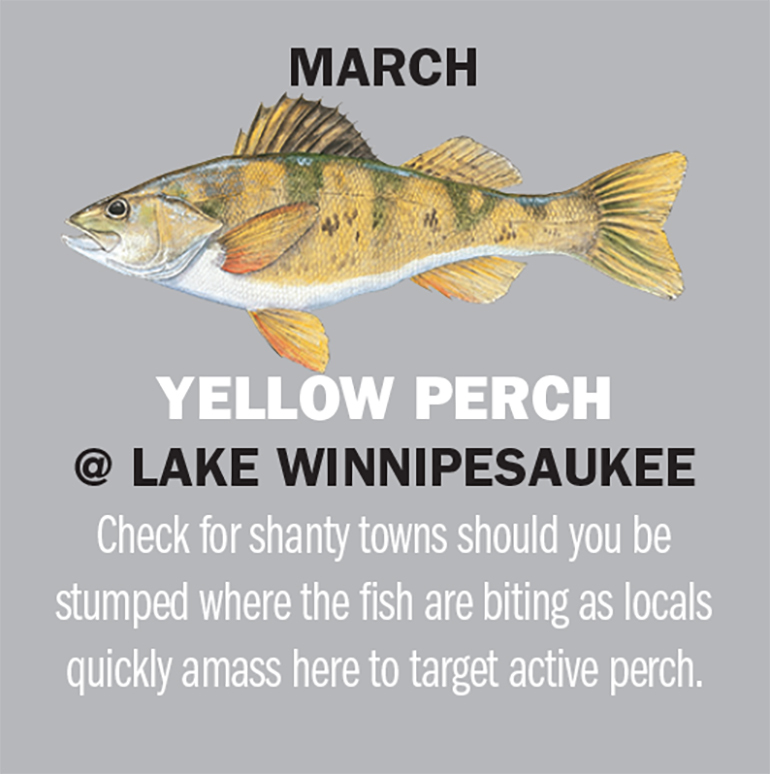 Massachusetts’ Lake Quinsigamond near Worcester offers plenty of action for yellow perch with or without ice cover. Set up near weed beds and probe the water column till a school of perch is found. 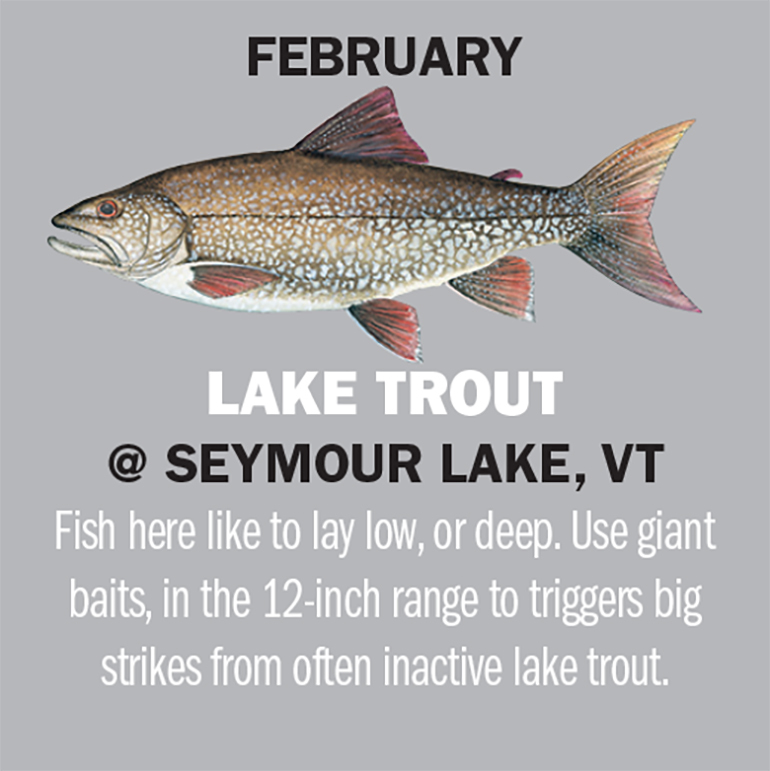 Seymour provides excellent lake trout angling action this month. Lakers in the 20-pound class are taken annually and fish over 10 pounds are caught each winter. Be forewarned that Seymour’s lake trout are deep-dwelling, moody fish that spend most of their time sulking on the bottom of the lake in nearly 170 feet of water. Use big baits to target big fish. Twelve-inch suckers or shiners are best, as well as fist-sized cut baits. Use extra weight to keep baits just off the bottom and to counter subtle currents. Jig occasionally and consider adding spinners, flashers or other eye-catching hardware. OTHER OPTIONS: Hardy anglers book overnight cod-fishing expeditions from Massachusetts’ party boats. Expect hot action under harsh conditions including bitter cold, blustery winds and rough water. Try Connecticut’s Mono’s Pond in Columbia for a relaxing day of ice-fishing for pickerel. Use jigging spoons or lively 3-inch shiners suspended just off the bottom. New Hampshire’s premiere vacation and fishing hotspot is the place to be for March perch through the ice. Conditions should be ideal for ice-fishing but always check with local authorities before heading onto the frozen lake. The easiest way for a visitor to assess Big Winnie is to look for “shanty towns,” areas where numbers of winter anglers have set up for the season. These are traditionally the best spots for all species especially perch, but bluegills, bass and even trout may show up on the line. For perch, cut holes in a wide arc and drop worms, shiners or small pieces of cut bait to varying depths until a school of perch shows up and the bite begins. Drop all lines to the same depth and reap the harvest until the action begins to fizzle. OTHER OPTIONS: Maine’s Kennebec River is known for its hot early-season brown trout fishery, which often begins in March as winter begins to break up. Streamers and lures imitating minnows excel. Vermont’s Lake Champlain offers some great northern pike fishing as the spawning season approaches. Target cruising fish in shallow water. 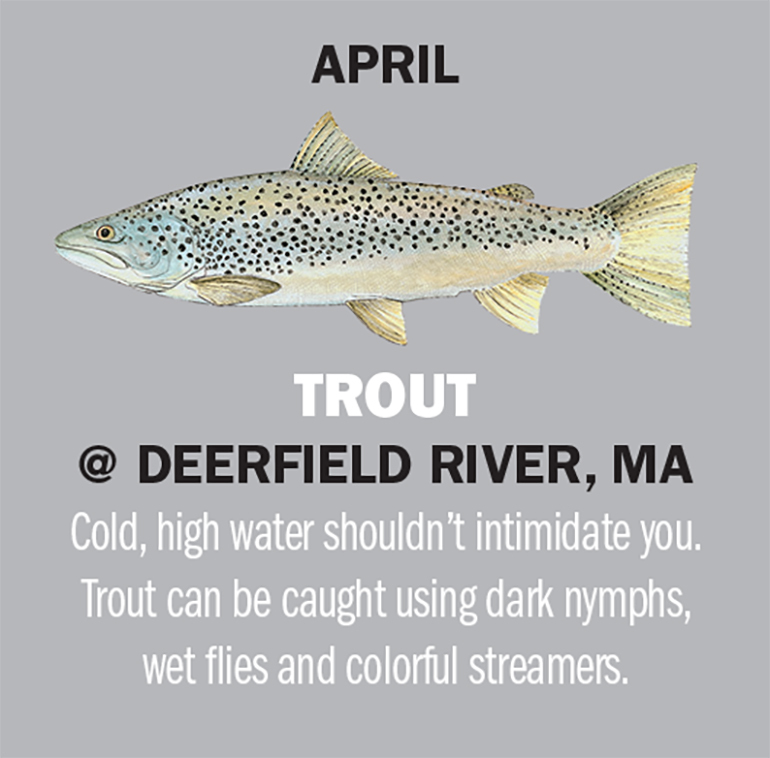 The Deerfield River is one of the best trout fisheries in the Northeast. Trout can be caught using dark nymphs, wet flies and colorful streamers. The Deerfield is stocked frequently and some 3-pound trout are taken from the Deerfield every spring. The portion of the Deerfield that is of most interest is a 1.6 mile stretch that begins at the boulder strewn Long Pool at the Fife Brook Dam and runs down to the Boston and Maine Railroad trestle. The lower catch-and-release area starts at the railroad underpass just above where Pelham Brook runs into the Deerfield and runs for about two miles before it ends at the Mohawk Campgrounds. OTHER OPTIONS: The Black Ledge River in Connecticut offers greater brook fishing for stocked trout. It’s ideal for short casts using nymphs, wet flies and spinners. Largemouth bass head for their spawning grounds on Rhode Island’s Watchaug Pond. Fish into the shoreline with diving minnow lures or spinnerbaits to tempt big bass off their nests. Maine’s fabled Penobscot River’ssmallmouth bass fishing is nothing short of phenomenal from Howland south to Bangor. The river bottom is full of prime smallmouth cover. Bass in the 5-pound class are often taken by anglers who patiently work the mid-river’s jumble of structure. Enjoy faster action by drifting a long cast from shore while targeting fallen trees, overhanging brush, stickups and other obstacles. The islands below Howland and Greenbush offer excellent angling all spring and summer, but in truth there is no particular stretch of the Penobscot that is better than the rest. OTHER OPTIONS: The upper reaches of the Connecticut River bordering Vermont and New Hampshire provides some excellent trout fishing for fly-fishermen this month. Most anglers are pleasantly surprised to find that the mighty Connecticut seems more like a mountain trout stream at its source. Hit the Massachusetts coast for early-season stripers. Fish the surf at dawn and dusk or at night. The biggest fish may be mere feet off shore. Lake trout over 20 pounds are common at Wachusett. Locals favor the Scar Hill Bluffs section at the end of Scar Hill Road in Boylston. The most popular method for lakers is fishing live shiners on a slip-sinker rig. Set up your rods and wait for a fish to take the bait. Check baits often; trout are notorious bait thieves. For a more active approach, use flashy lures in the 3/4- to 1-1/2 ounce range. Allow the lure to sink all the way to the bottom and then yank the bait up and then allow it to flutter back to the bottom. Gold, silver, silver/blue, gold/green and gold/orange and the hard-to-find “brook trout” colors are standard at Wachusett. OTHER OPTIONS: Vermont’s White River is one of the region’s premier June trout waters. Easily fishable from shore or by wading, the White and its many tributaries contain native and wild brook trout, wild and stocked rainbows, and wild and stocked brown trout. Sebec Lake in central Maine is noted for its abundant landlocked salmon, which are most abundant near the dam and downstream to Milo. Head for Connecticut’s Long Island Sound for some of the best, most exciting bluefishing action in the Northeast. Blues may be taken from shore while casting large flies, sturdy lures or drifting cut bait. Experienced boaters with sea-worthy craft will strike gold if they look for current seams in the Sound and anchor directly over the obvious “split” in the water. Drop tins, jigs or chunks of mackerel to the bottom and work them to the surface. Other options include “hunting” blitzing bluefish. Toss a big topwater lure into the frenzy and hang on. OTHER OPTIONS: Connecticut River northerns may be taken in Keeney Cove in Glastonbury. Flashy diving lures and noisy topwater plugs work well for these aggressive fish. Branns Mill Pond in Dover-Foxcroft, Maine offers excellent night fishing for horned pout (bullheads). Rig with night crawlers, cut bait or chunks of liver fished on the bottom just off shore. Maine’s Rangeley Lakes are quickly turning into a top destination for northern pike. Popular methods for taking pike include casting large, noisy lures into and around weed beds, logs, stumps and other structure. Trolling is also a popular technique, working slowly along the edges of weeds, over channels and drop-offs. Hook a 12-inch shiner below the dorsal fin and suspend it below a large bobber just outside weedy cover in water that’s 10 to 20 feet deep. This technique works well over open channels and deep holes where predatory pike suspend in hopes of ambushing passing schools of baitfish and other prey. OTHER OPTIONS: Boston’s Charles River is the place to be for late-summer bass fishing. Work the shoreline at dawn and dusk or ply the deeper holes at midday with crankbaits, diving minnows and spinners. Rhode Island’s Misquamicut beach area offers some excellent shoreline striper fishing this month. Fish at night or very early and late in the day to avoid conflicts with recreational users. This popular and productive lake in western Massachusetts near Pittsfield offers easy access for kayakers and boaters and plenty of excellent action for a variety of species ranging from trout to muskies. In September the lake’s abundant, aggressive pickerel population is easy to find close to shore in weedy cover and near exposed structure. Most pickerel anglers can fish all day with the same weedless topwater offering without having to change lures. Pickerel will continue to attack anything that moves under its own power and will hit again and again as long as the target continues to move. OTHER OPTIONS: September is prime time for New Hampshire’s Piscataqua River big-water stripers. Massachusetts’ Quabbin Reservoir remains open for lake trout fishing through Oct. 20. Fish deep and slow with flashy lures with a fluttering retrieve that will catch slow-moving lakers’ attention. The Farmington River’s best trout fishing is on the West Branch tailwater out of Colebrook Reservoir and the West Branch reservoirs. The Farmington has two separate Trout Management Areas in that section of the river. Small spinners, spoons and crankbaits excel but during early morning and late afternoon they seem to prefer dry flies, streamers and nymphs. Woolly Buggers in various sizes and colors excel especially when targeting the biggest holdover fish and the river’s elusive, trophy-class browns. OTHER OPTIONS: Now’s the time to go for Massachusetts’ Cape Cod stripers. Big cows in the 50-pound class can be caught in the surf, especially after dark, using live or dead eels, cut bait or large, shiny lures. Lake Champlain’s king-sized lake trout will be heading toward the bottom now where they spend the winter. You’ll need elaborate gear including downriggers to get lures down to the biggest fish. Slow trolling over deep-water structure is key. Covering the most territory in a well-planned grid that puts lures right under the noses of sedentary, sluggish fish is the name of the game. Use gangs of big, flashy spinners ahead of bright-colored lures in order to attract lake trout, which trout confuse with a fluttering school of hapless baitfish. OTHER OPTIONS: Connecticut’s Long Island Sound offers great November striper fishing. Use live or dead eel rigs or throw big, flashy lures into the surf at night and near dawn and dusk. Head for Cape Cod’s famed kettle ponds for some hot late-season bass-fishing action. Use colorful jigs fished slowly in deep water to fool bottom-hugging bass. 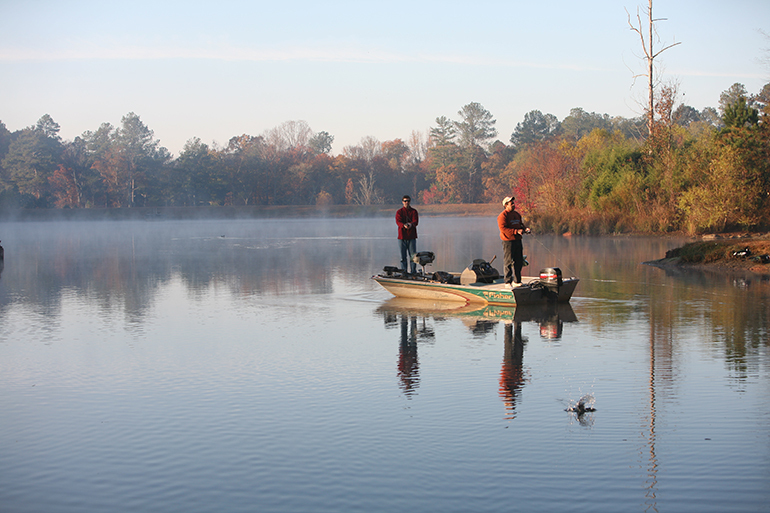 Actually, two small lakes connected by a deep thoroughfare, Boyd Lake near Milo is one of the state’s many unsung pickerel-fishing hotspots. Both ponds have good numbers of over-sized pickerel. Fish the shallowest, weedy water in the big pond, or anywhere along the shoreline on the small pond. Work the water column from top to bottom to locate active fish. Three-inch silver or golden shiners hooked just behind the dorsal fin work well. OTHER OPTIONS: New Hampshire’s Lake Winnipesaukee should have safe ice near shore, enough for anglers to set up for bluegills in and over weed beds. Rhode Island’s Wallum Lake in the northwest corner of the state receives helpings of stocked trout from Rhode Island and Massachusetts.